The Kiel Week regatta, held in the regional capital of Schleswig-Holstein, is the largest sailing event in the world and a festival celebrated by millions. Besides the top sporting action, Kiel Week presents sailing in all its fascinating diversity – from classic yachts and cutter regattas on Kiel's inner firth to the grand parade of tall ships on the second Saturday of the event. At Kiel Firth, where the sea seems to meet the sky, you can experience all the maritime charm of northern Germany. For 30 years, sailing fans and visitors from all over the world have gathered here to enjoy northern Europe's biggest summer festival. The event features around 2,000 ships and boats, regattas in every Olympic discipline and 16 other national and international boat classes – not to mention musical entertainment and delicious food and drink. 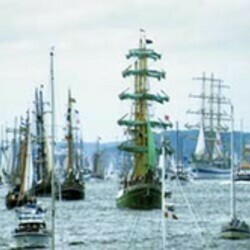 And you don't need to be a sailing enthusiast to enjoy the ten-day programme – the breathtaking parade of around one hundred historical sailing ships and the spectacular firework display over Kiel Firth are two highlights enjoyed by all. A classical open-air concert outside the town hall, jazz resonating from the city's lanes and culinary delights from kitchen, cellar or galley are all part of the programme. An adventure park for budding explorers, a cities forum, a number of exhibitions and the International Warsteiner Hot Air Balloon Sail complete the programme for this unique festival. There's nothing quite like it anywhere else in the world, which is why the world descends on Kiel year after year.